The McKendree volleyball team had won the first two sets, and yes, the team was undefeated on its home turf. Win or lose, both would be advancing to the conference tournament so the University of Missouri-St. Louis women's volleyball team could have let it go. But Danielle Waedekin wasn't having it. Waedekin made an ideal candidate for such recognition, something only five other UMSL athletes - none of them volleyball players - had received before her. 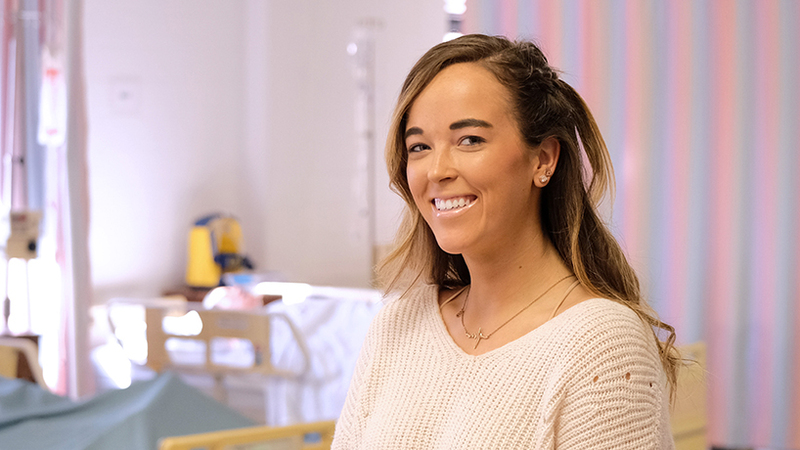 In the College of Nursing 's rigorous program, Waedekin flourished, maintaining a 4.0 GPA while balancing her busy practice and game schedule. She shone athletically, starting in all 60 of her UMSL matches and helped the team finish the 2017 season with its best record since 2008. Wanting that away-from-home college experience, Waedekin originally selected Indiana State University, where she was a starter on its team. However, during her first year, she realized that the program wasn't a good fit. The coach gave the nursing students grief for choosing time-intensive academics, and the players were as competitive with each other as the other teams. Because of her scholarships, Waedekin stuck it out for a second year and switched her major to the less-demanding health sciences. Ultimately, the situation wasn't tenable for her, and she decided to transfer. While scoping out potential schools, one of Waedekin's club coaches suggested UMSL because of the coach, Ryan Young. Plus, the school was close to Waedekin's family, she liked the campus and then there were the genuinely nice players. Participating in the Academic All-American ceremony with College of Nursing Dean Susan Dean-Baar was a highlight of Waedekin's UMSL experience. She has also valued developing relationships with her instructors such as Amanda Finley, who is Waedekin's go-to resource for questions, and the admiration is mutual. Waedekin has especially enjoyed studying mental health, obstetrics and pediatrics. She's thinking that labor and delivery or pediatrics might be in her future after school, possibly as a travel nurse, which aligns with her love of travel and experiencing new cultures.